Yay for being back on YouTube! I've been HORRIBLE so please forgive me. Better late than never, amirite?? Today I've got the highly requested sunglasses collection to share. Please only nice comments as I do realize I have wayyyy too many. Good thing for crazy sunglasses hoarders like myself, we can now rent sunglasses! Yes, Redbox for sunglasses are here. You can rent ones from Ray-Ban to Prada so what's not to love? It's only $19 a month and with this code [COVERINGBASES] you get your first month free! So if nothing else, you can check it out for a month and see how you like it (you'll love it). So keep reading below for all the links and the fun fun video I just made! RENT Your own designer sunglasses here and use code: COVERINGBASES for your first month free! I love the tortoise Ray Bans, such a great video! It's fun to see all of your sunglasses! so impressed with your collection. smart to have the cases so you can see what you have. i recently ordered a pair of amazon sofake sunnies... can't wait for them to arrive it's taking forever. I am addicted to sunglasses too, I just can't get enough! Fun video! I'm pretty envious of your sunglasses collection! I just want to shop your sunglass collection, is that even a thing?! what size classic gold/green ray ban aviator sunglasses do you have? 55 or 58?! Such a great sunglasses collection! LOVING the Toms sunglasses - Especially since they give portions of the profits to charities for sight! Thanks for sharing! 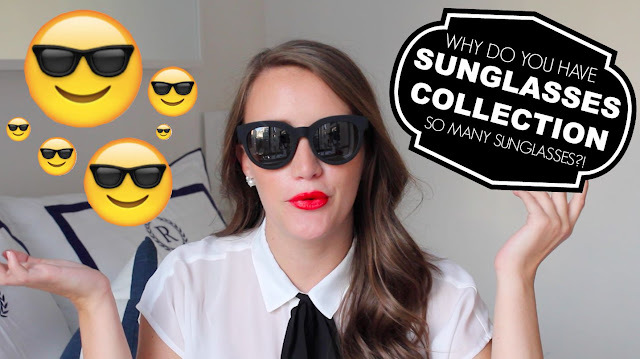 Loved this video- who knew you had SO SO SO many sunnies? !